30 Second Wine Advisor: HOW much alcohol? I was delighted to see the "G" shield logo of Rhone producer Olivier Cuilleras's Domaine la Guintrandy on a bottle of Côtes du Rhône at a local wine shop the other day. I had loved Cuilleras's budget-level Saint-Leger Vin du Pays du Comté de Grignan (March 4, 2011 30 Second Wine Advisor,) so I was more than ready to fork over $20-plus for this fancier model, an old vines Côtes du Rhône Villages from the village Visan. So eager was I that I failed to exercise due diligence on the label's small print. It wasn't until I got it home that I noticed its alcohol content: 15.5 percent! Whoa! We're talking here about alcohol approaching the upper reaches of yeast's capability to ferment fruit sugars into alcohol. Stronger wines usually must resort to fortification with brandy to achieve higher octane. I've actually seen Fino Sherry with less alcohol than this. I've ranted before about the latter-day tendency toward higher alcohols that throw table wines out of balance and compromise their compatibility with food. In a word, "Grrr!" Cranky but trying to be open-minded, I fashioned a brace of juicy rare bison-burgers and pulled the cork on Domaine la Guintrandy 2007 Côtes du Rhône Villages Visan Vieilles Vignes. It smelled great in the glass, and to my pleased surprise, it tasted very good indeed, both with the locavore bison meat and sipped as a post-prandial drink thereafter. It's a hearty, robust wine, but to its credit, that heady alcohol level didn't manifest itself as harsh, hot or otherwise obnoxious. High praise to Olivier Cuilleras: Say what you will about 15.5% alcohol wines in general, he fashioned this one well. We're reaturing this and other wines of the Southern Rhône in Wine Focus for March in our WineLovers Discussion Group. Join us as our friendly international crowd of wine lovers share our thoughts, questions and tasting notes on the wines of the the region. To participate, simply click to the topic "Farther on up the Rhône!" FOOD MATCH: Good with just about any red meat or grilled or roast poultry dish. It was fine with medium-rare Kentucky-grown bison burgers. VALUE: The $20-plus mark would be a bit spendy on the price-for-value scale for Côtes du Rhône for me, but in fairness, the bottlings from named villages often surpass this and, for sought-after villages, even the $30 point. On quality alone, without considering comparatives, this price is competitive. WHEN TO DRINK: Fine now, but I think its robust balance of fruit, acidity and tannins with high alcohol will see it live and evolve over at least five years of cellar time. Click here to visit the Visan Vieilles Vignes page on the Domaine la Guintrandy site. This link goes to the importer's website. 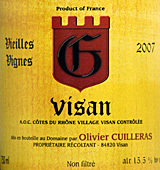 Check prices and find vendors for Olivier Cuilleras 2007 Côtes du Rhône Villages Visan on Wine-Searcher.com.